The Old Inverchroskie Kennels at Inverchroskie in Enochdhu, near Pitlochry, Perthshire sleeps 2 people. 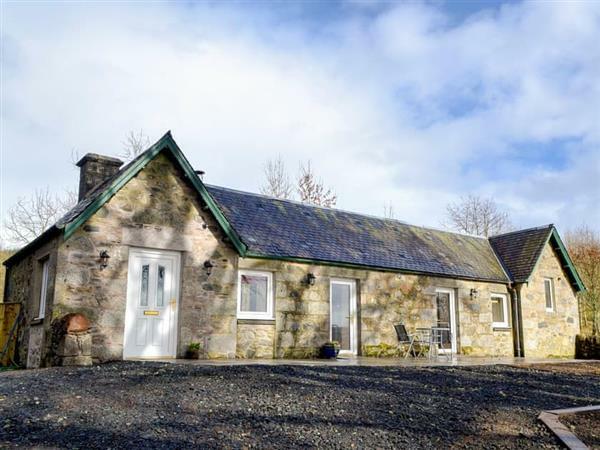 Inverchroskie near Pitlochry is set within the owners’ 17-acre grounds; The Old Inverchroskie Kennels is a beautifully modernised, detached stone-built cottage set in an elevated position. Commanding fine views of the grounds and hills beyond, there is a stone patio at the front, perfect for sitting out on sunny days with a glass or two, and a private garden area at the back with another sitting-out area, where you can often see the red squirrels bounding from tree to tree. Inside, the open plan living room and kitchen are flooded with light from the high Velux windows and French doors, and there is wood burner adding to the sense of comfort within. Wildlife abounds with red squirrels, fallow deer, hare and endless birds on the property, and pine martens can be seen from a nearby local hide. With a plethora of walks and cycle paths waiting to be explored nearby, including the Cateran Trail, your holiday can be as relaxing or as energetic as you like. The village of Kirkmichael is only a couple of miles away with two pubs, a local shop and tearoom. Pitlochry is 10 miles away with shops, eateries, salmon ladder and festival theatre - a very popular venue which hosts a wide range of productions throughout the year. The lively towns of Blairgowrie, Perth and Dundee (home of Captain Scott’s ship ’Discovery’) are within easy reach, along with the skiing resort of Glenshee, the largest ski area in Scotland. Beyond Glenshee is Braemar, home to the famous Braemar Gathering, a key event in the Scottish Highland Games calendar and one attended by Her Majesty the Queen every year. You will find the shop, pub and restaurant 2 miles from Inverchroskie near Pitlochry. The Old Inverchroskie Kennels can be booked together with Inverchroskie Cottage (ref UK5602 [Inverchroskie Cottage]) to sleep up to 7 people. The Old Inverchroskie Kennels is all on the ground floor. Living area: With wood burner and 40 Smart TV. Biomass underfloor heating, electricity, bed linen, towels, Wi-Fi and logs for wood burner included. Welcome pack. Front garden with patio. Rear garden with patio and garden furniture. Private parking for 2 cars. No smoking. Please note: The property has a natural water supply from a borehole. The front garden is sloping. Holidays at The Old Inverchroskie Kennels, Inverchroskie run from Friday to Friday. Pets allowed at Inverchroskie - The Old Inverchroskie Kennels. For a better idea of where Inverchroskie - The Old Inverchroskie Kennels is, you can see Inverchroskie - The Old Inverchroskie Kennels on the map below. Inverchroskie - The Old Inverchroskie Kennels is in Perthshire; should you be on the lookout for a special offer, you can find all the special offers in Perthshire. It's always worth checking to see what is on offer at the moment. Do you want to holiday near Inverchroskie - The Old Inverchroskie Kennels (UK10652), you can see other cottages within 25 miles of Inverchroskie - The Old Inverchroskie Kennels; have a look to find your perfect holiday location.